The days of incandescent lamps are over. LED lighting takes over nowadays as they are much more energy efficient. LED lights on the other hand require a good controlling circuit to operate correctly and this is the so called LED driver circuit. LEDs are basically a form of diode that gives off light when forward biased. A diode is rated by its forward voltage of 0.3V or 0.7V for germanium and silicon respectively. For LED lights, the forward voltage is higher than the diode and may be typically as high as 2V-3.5V, per LED. Some LEDs that has higher voltage specified is already combination of several LEDs. LEDs are DC in nature, but why LEDs lights are being used directly in replacement for incandescent and CFL lamps in AC socket? This is made possible using LED driver circuit. 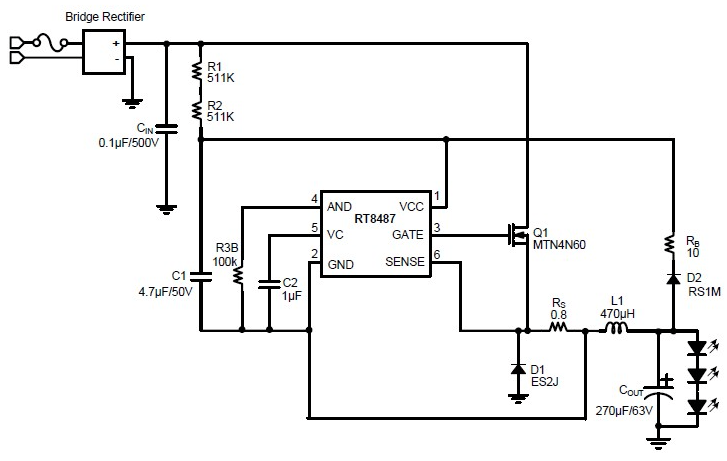 A LED driver circuit will convert AC into DC level that is safely usable by the LEDs. There are some available solutions out there for LED driver circuit. LED drivers are can be linear or switching. Let us familiarize these solutions. 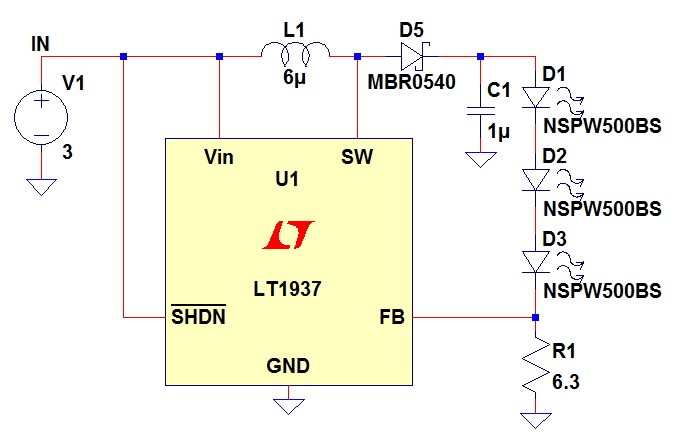 Linear LED driver circuit uses a linear device to control the current to the LEDs. This circuit solution is not efficient at all and limited to small power application only. A linear LED driver is can be a simple voltage source and a current limiting resistor only; it is indeed very simple that is why still a popular solution of driving LEDs. Another advantage of a linear LED driver is that it can provide very clean light, I mean for clean is that there is no blurring or flickering effect. Below circuit is a very simple way of driving LEDs. Basically it is only composed of a DC voltage source and a limiting resistor, Rlimit. However, in this solution, the voltage source must be a pure DC or linear level so that the current setting to the LEDs will not change. In the event that the current to the LEDs will vary, the illumination will somewhat shows intensity change and this is not nice to see by the eyes. Another drawback of a changing LED current is that the LEDs may overheat and get damage. In the above example circuit, the voltage source is a pure DC and the LED current set by the limiting resistor is 600mA. This gives a total LED power of 8.332W. 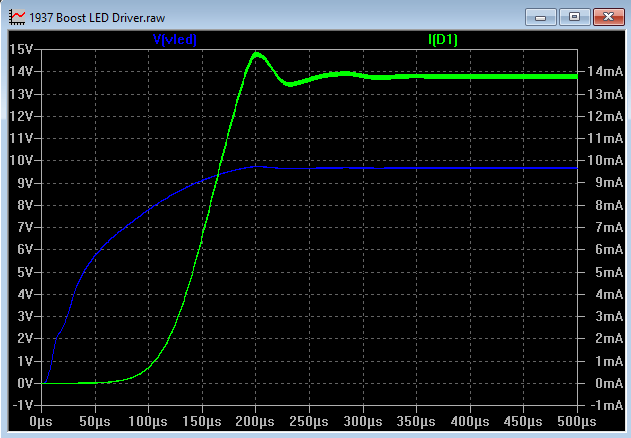 The current limiting resistor is dissipating 3.67W. The total power applied to the circuit is 12W and the efficiency is only 69.43% which is very low. Above example is very basic and elementary approach of driving LEDs. 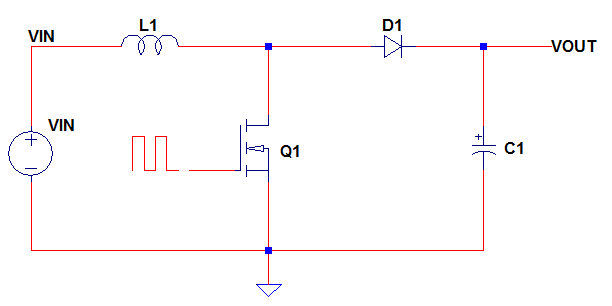 In the event of a varying voltage source, a linear regulator can be used. A linear regulator is able to accept varying input voltage while making the output voltage constant. It is still a lossy solution of driving LEDs but better than the first approach in terms of current stability to the LEDs. 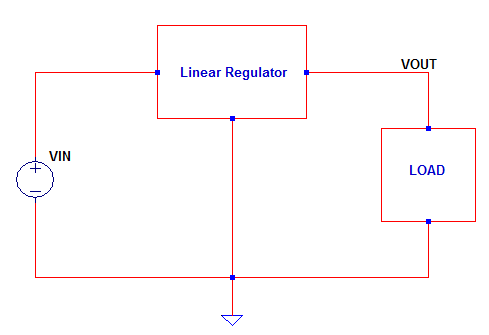 Below diagram is a typical linear regulator circuit. VOUT is the node where the load is applied and it is regulated to a voltage level set by the user. Supposing the input voltage range is 9-16V, the output voltage will remain the same; for instance 7.5V per setting. When the difference between the input and output is huge, the linear regulator dissipates huge power in order to maintain a regulated output voltage. The property of a linear regulator to maintain output voltage is making it popular to driving LEDs. 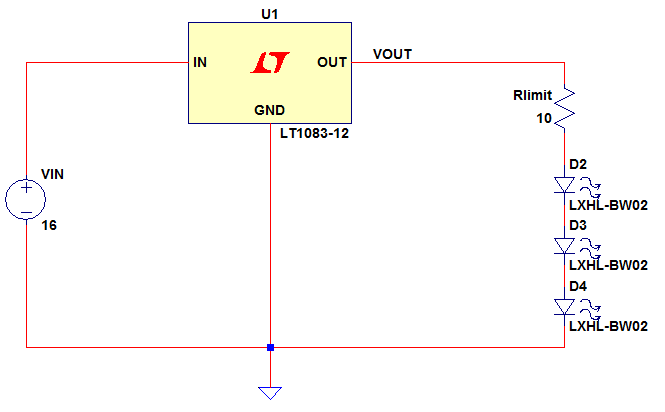 Below is a LED driver circuit using a linear regulator from Linear Technology, LT1083-12. The output of this regulator is 12V fixed. Still, a series resistor is needed to set a current level safe for the LEDs. The LED current in this circuit is 261.6mA. The LED power is only 2.452W. The power dissipated by the limit resistor is 0.684W. Power Regulator = (VIN – VOUT) X (LED Current + quiescent current) = (16V-12V) X (261.6mA +5mA)= 1.0664W. The efficiency is very poor the same with the previous solution. The efficiency will further decrease when operating at higher input voltage. There are specific linear ICs designed solely for LED driver application. The concept and analysis on the power section side however is the same on with the above example. These ICs advantage is in terms of multiple LED strings driving capability and built-in protections for short and open LEDs. Another advantage is the inclusion of a dimming function. A generic linear regulator does not have a dimming function. 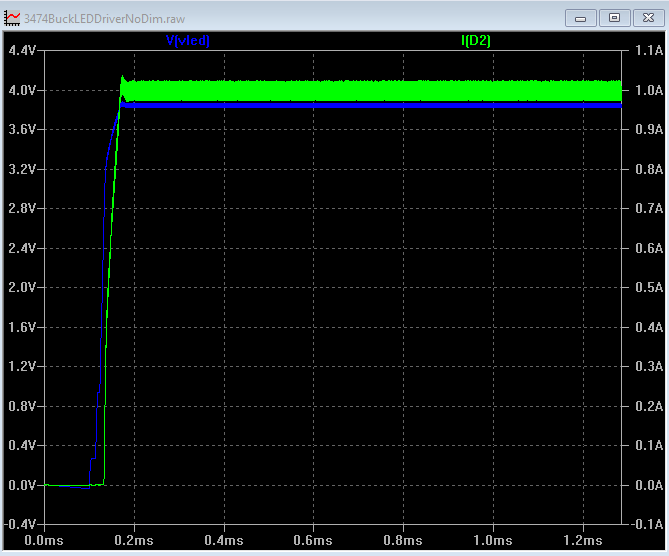 One example of this solution is BD8374HFP-M from ROHM semiconductor. Below is the application circuit. It is only a single channel, with dimming capability, open and short LED protection, over voltage and over temperature protection. For this controller, the way to set a LED current is through the RVIN_F resistor. This resistor is located in the input as opposed to the previous examples above that is located in series to the LEDs. In this solution, the LED voltage will set the output voltage of the controller IC. In using a typical voltage regulator, the output is a fixed voltage but here, the output is variable depending to the total LED forward voltage. The total LED power is simply the sum of the LED forward voltages times the IOUT or set LED current by the resistor RVIN_F. The power dissipated by the linear IC (BD8374HFP-M) is the difference between the input voltage and total LED forward voltage drop, times the output set current. On the other hand, the power dissipation of the current setting resistor RVIN_F is just its voltage drop times the output current or the square of the output current times the resistance. The efficiency calculation is can be done the same from the above example. In linear mode type of LED driver, the input voltage variation is narrow as limited by the power dissipation of the linear controller. The losses are huge as well in the linear solution. These shortcomings are solved by switch mode type of LED driver. 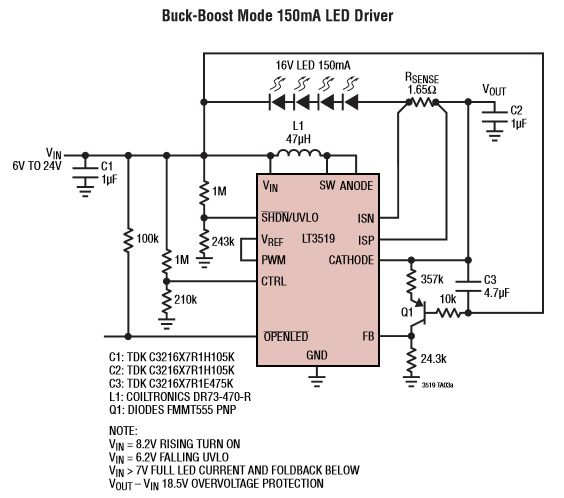 A switch mode LED driver is can be a step-down (buck), step-up (boost) or combination (buck-boost). 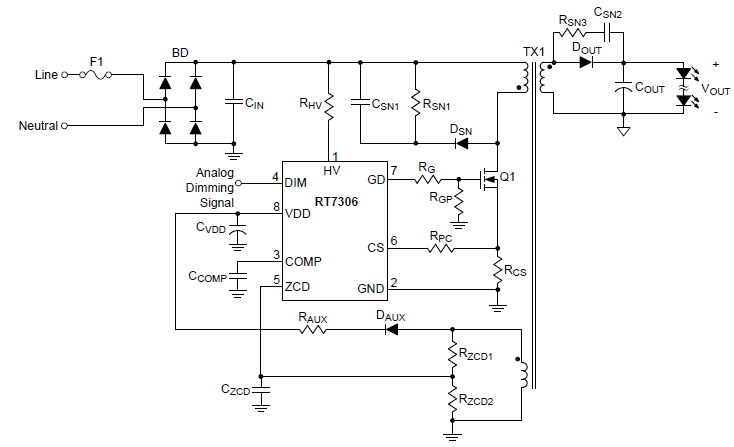 A switch mode LED driver is can be used directly from a universal AC line; say 90-264Vrms. Switch mode means that the controlling device is operating in continuous switching state between turn on and turn off of a switching device like MOSFET or BJT. At turn on of the switch, there is ideally zero resistance so ideally zero power loss. At turn off on the other hand, there is ideally zero current thus no power loss as well. These behaviors make the switch mode solution more efficient than the linear solution. However, switch mode approach is more complicated than the linear solution and will cost higher. Below is a generic buck converter power section circuit diagram. Buck converter is a step down switching converter. Its output is always lower than its input. The MOSFET Q1 is driven into saturation and cut-off by the PWM signal in order to generate an output voltage. The inductor L1 is serving as an energy storage which charges when the MOSFET Q1 is driven into saturation. It discharges when the MOSFET Q1 is driven into cut-off. The capacitor C1 is serving as a reservoir also to minimize voltage fluctuations in the output rail. It charges when Q1 is driven into saturation while discharges when Q1 is driven into cut-off. The diode D1 serves as a path for the inductor current when it discharges, it is only functioning once the MOSFET Q1 is at cut-off state. Below circuit is LED driver circuit based on buck topology. It is working pretty well in simulation so in actual. The controlling device is LT3474 from Linear technology. The power path is from IN, to U1 internal switch (Q1 in the generic buck converter above), to L1 and C3 (C1 in the generic buck converter above). D1 is the inductor discharge path diode as with the D1 in the generic buck converter circuit above. The circuit allows wide variation in the input voltage in contrast to the linear solution. The calculations of the power section of this driver circuit are the same to the generic buck converter we discussed above. 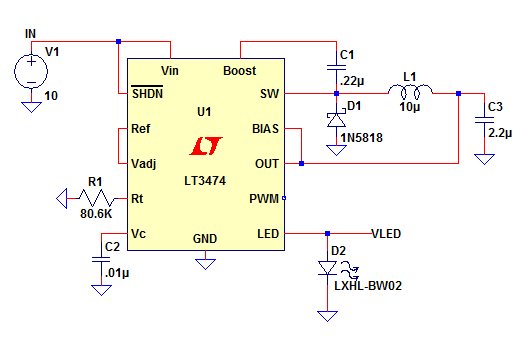 This LED driver circuit has a PWM dimming capability by applying PWM signal on the PWM pin. As you can see on the above waveform, the LED voltage which is the output voltage of the buck is less than the input voltage which is 10V, as Buck is a step down converter. The LED current is modulated to achieve dimming. Below circuit is a simple LED driver derived from a boost converter. With a boost driver, the input must always be lower compared to the total forward voltage of the LEDs. 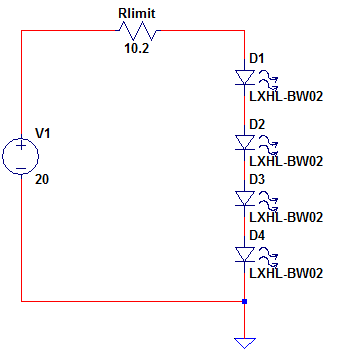 In this circuit, the input voltage is 3 while the total LED voltage is 9.64V based on simulation. If the application needs a very wide voltage range that cannot be accommodated by a boost or a buck alone, then consider using buck-boost derived LED driver. An example of this is below circuit from Linear Technology. What we discussed solutions above are all DCDC applications. How about if we want a LED light that we can directly plug to an AC socket, like the commercial LED lights available nowadays, what should we do? This tie we need another LED driver circuit suited for ACDC purpose. There are few things to make this possible. Below circuit is a simple non-isolated ACDC LED driver. It consists only with passive devices and the Zener and diode. This is an economical solution but not efficient and safe to use. Be careful. 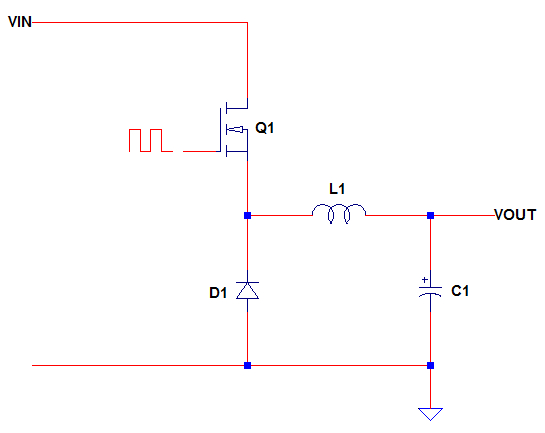 Below solution is still non-isolated as there is no presence of isolation transformer. This is a solution provided by Richtek using RT8402 controller. 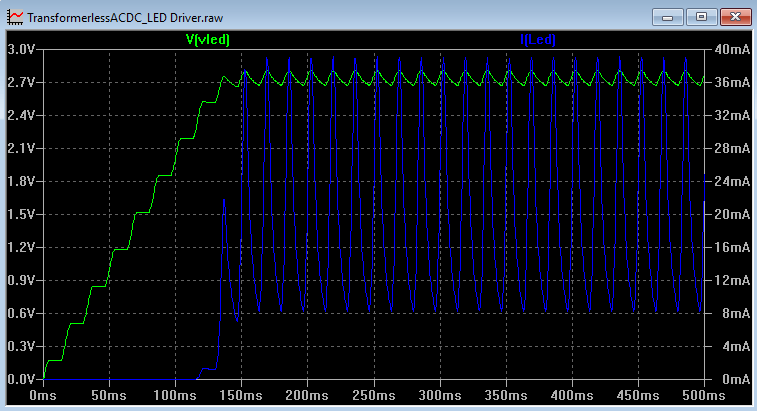 However, this driver is efficient compared to the first circuit above. 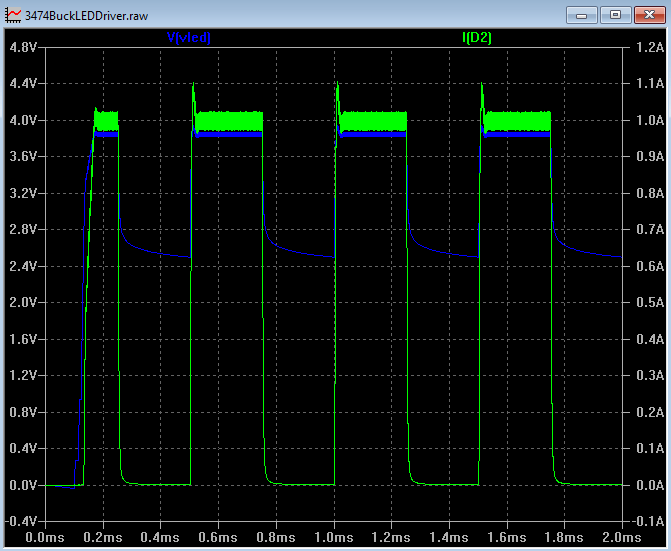 This particular solution is a buck derived AC-DC LED driver. The bridge rectifier converts AC into DC and Q1, D1, L1 and EC1 are the buck converter power section. This is an efficient driver since Q1 is operating between saturation and cut-off. Still, be careful, this solution is non-isolated. Both solutions are commonly used in commercial low power and low cost LED lamps. For high power LED lights or lamps, below circuit is preferable. This is a solution from Richtek using RT7306. It is a flyback derived LED driver. The presence of the transformer introduces isolation between the AC line and the LEDs. There is no danger for electric shock if you accidentally touch the output side. Being a flyback topology, the driver is able to handle wide input voltage range from 90-264Vac. This solution is also efficient at power less than 50W. However, at power more than 50W, the efficiency may decrease but still high enough compared to the linear solution. Nice work,covered the range of options. I’d give other examples than LT, they are pricey. For linear look st the BCR40x series. Diodes Inc. is now sourcing them (along with Infineon who has had them for a long time) so may be more affordable.